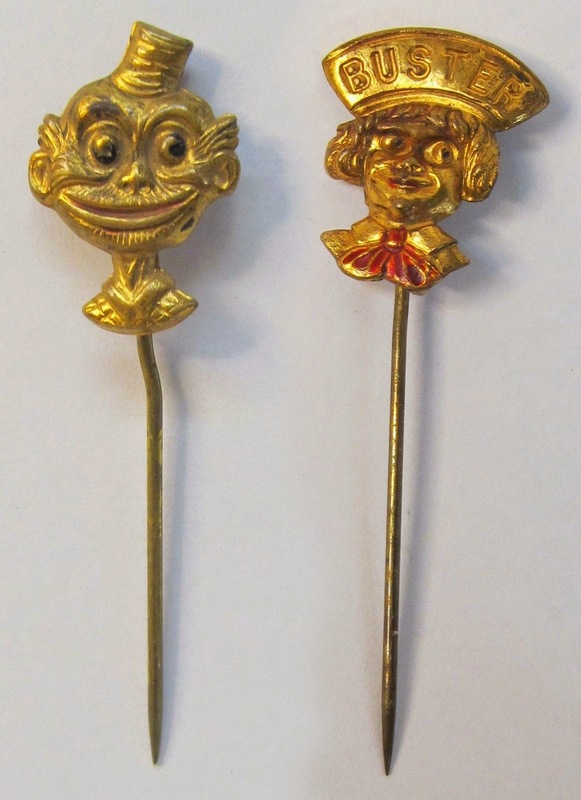 The image you see here is of two small pins from the early 1900s, one depicting Happy Hooligan and the other Buster Brown. They're both brass with just a touch of paint, and measure about about 2¼" each. The two figures were, of course, the titular characters of their own comic strips which debuted in 1900 and 1902 respectively. What strikes me about these is that I don't believe these to be toys, or for children. While brass certainly isn't as precious a metal as gold or silver, it's not exactly cheap enough to make toys out of. Certainly not 100+ years ago. So what we have here are two pieces of (admittedly) costume jewelry featuring two prominent comic strip characters. What's more, Buster is clearly labeled as such. Which is interesting because, although Richard Outcault did name both the character and the strip "Buster Brown" for their debut in the New York Herald, Outcault left for William Randolph Hearst's papers in 1906. And there was an ensuing legal battle which resulted in the Herald keeping the Buster Brown name. Outcault continued drawing a Buster Brown style strip for Hearst, but both the character and even the strip itself could not use the Buster Brown name. That suggests the pin was created before 1906. And it also suggests that the pins' creator(s) did not get official licensing rights to either of the characters as, prior to that time, s/he would have had to secure rights from multiple sources. Happy Hooligan was, from the start, in Hearst's papers while Buster Brown was only in the non-Hearst-owned Herald. Granted, we're still talking about New York City in both cases, so it's certainly possible that the crafter could have just made the trek to both papers indepependly. Neither would have been THAT far removed from the other (and I can't even pin down, if you'll excuse the pun, a specific date for either of these, so they could have been made years apart) but that strikes me as unlikely. Regardless, I'm now forced to imagine the type of person who would've bought and worn these, and to what type of function. I'm thinking well-to-do immigrants who wanted to show off some of their success, and appreciated the more slapstick humor of Hooligan. But these wouldn't be day-to-day wear, would they? Probably not for Sunday church services either, right? A night out to a vaudeville show, perhaps? Any other ideas? Possibly some similarities to the fade-out of pins like this. 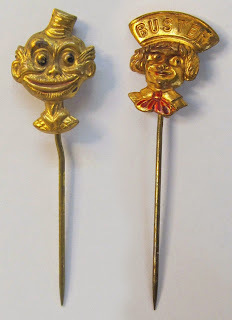 I think lots of people once wore hatpins or stickpins in a variety of situations, in which case you can imagine a space for relatively wacky objects like this developing. Now, though, it's difficult to guess its details because few of us ever wear such objects at all.